For all you Ashtown Burial fans, book two is nearly here! 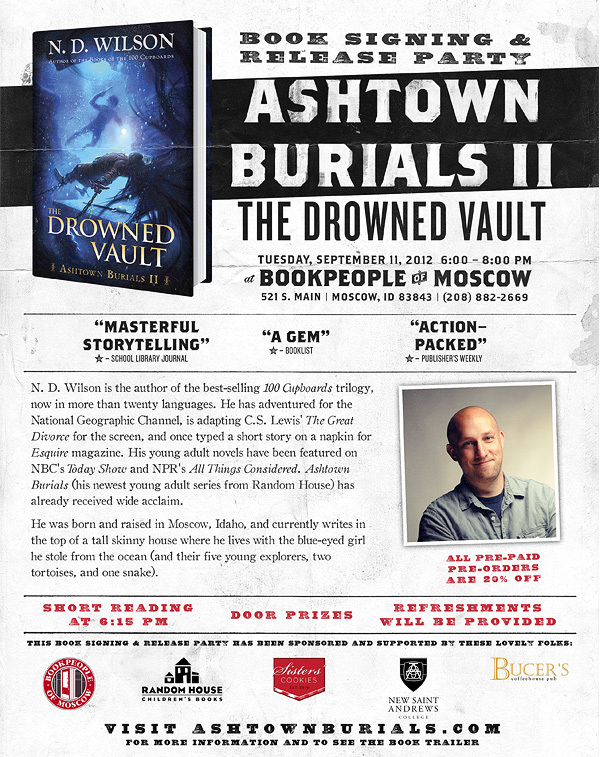 The Drowned Vault hits stores on September 11. We’re having a release party at BookPeople in Downtown Moscow from 6:00 – 8:00pm. There will be a short reading, Sister’s Cookies, Bucers ice coffee, and door prizes. All pre-paid, pre-orders are 20% off. If you’re in the area, come on down! Most of you aren’t local, but you can still get a signed copy at 20% off. Call in a preorder to BookPeople (208- 882-2669) to get the discount price and Nate will be happy to sign it before they ship it out. Think early Christmas presents… Hope to see many of you there! By heatherlinn | Filed under Uncategorized | Tags: Happy Heather, News! Now wishing we had not alrady pre-ordered ours on Amazon. A signed copy would be fun!